Extremely flexible ,lightweight, comfortable, perfect choice for Latin amateur and professionals. Quickstep, Viennese waltz, Salsa, Tango, Waltz, Foxtrot, Rumba, ChaChaCha, Swing, Disco, Samba. Please refer to the left size table, and select the corresponding size according to your feet length. If you have wide and thick feet, please choose a larger size. Our shoes are made of environmentally friendly materials, please feel rest assured for wearing. It's normal for new leather shoes to have a little pungent smell, but the smell will gone naturally after one or two days ventilation. NLeahershoe Please refer to the left size table, and select the corresponding size according to your feet length. If you have wide and thick feet, please choose a larger size. Our shoes are made of environmentally friendly materials, please feel rest assured for wearing. It's normal for new leather shoes to have a little pungent smell, but the smell will gone naturally after one or two days ventilation. NLeahershoe Design philosophy conform to human engineering prospects and it accentuates your leg length, ensure you are graceful and stylish with it. 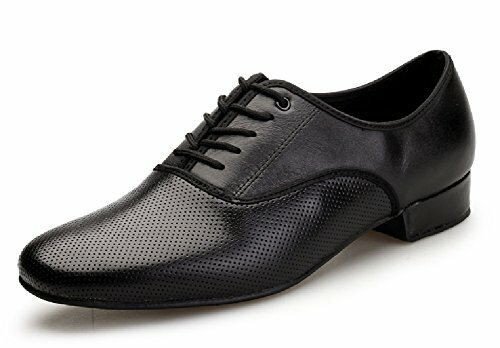 NLeahershoe Anti-slip and lightweight outsole comfortably fit your feet, you will feel more confident in it, move smoothly and freely on the dance floor. NLeahershoe Premium leather for vamp, smooth and skin friendly, various air holes provide great breathability. Exquisite workmanship to bring you comfortable enjoyment. NLeahershoe Maximum order quantity is 2 pair, if you need more, please place another order. If you have any questions about this product by NLeahershoe, contact us by completing and submitting the form below. If you are looking for a specif part number, please include it with your message.